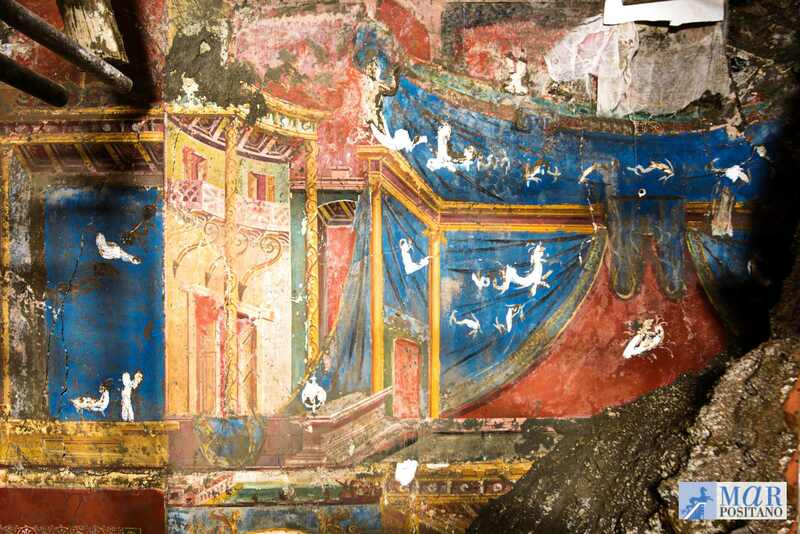 enerally speaking, Roman Wall painting is divided into four characteristic and chronological styles. 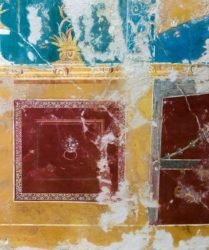 The fresco uncovered in Positano belongs to the so-called Fourth Style associated with the middle of the 1st century AD and was probably inspired by the new artistic developments that came about during the construction of the Emperor Nero’s sumptuous villa in the heart of Rome. 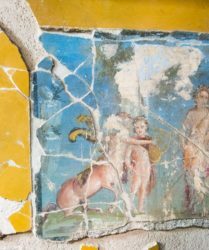 This new style of wall painting quickly became widespread throughout the Roman Empire and was being practiced until at least 79 AD, the year Vesuvius erupted, destroying towns and cities around the volcano, which meant classifying later Ancient Roman painting styles as they evolved was no longer feasible. Dividing a wall into three horizontal areas – lower, central and upper – is one of the characteristics of the Fourth Style. The central area typically alternates large panels and trompe-l’oeil architectural details that show a renewed appreciation for the articulated perspectives seen in the Second Style. The central panel always has a painting of a mythological scene or subject, whilst the decorative elements of the side panels vary, with a series of small paintings of landscapes, flying figures, cupids, medallion style portraits etc. 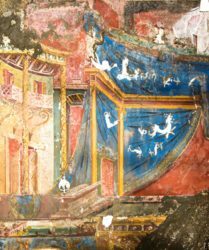 The upper area of a wall is decorated with aedicules (small temple-like structures) painted in perspective and enriched with floral and fantastical elements. 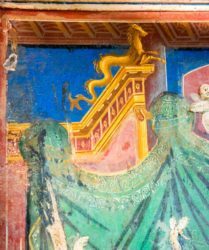 Another compositional detail typical of the Fourth Style is the use of scaenae frons, the elaborately decorated permanent architectural backdrop to the stage in a Roman theatre. 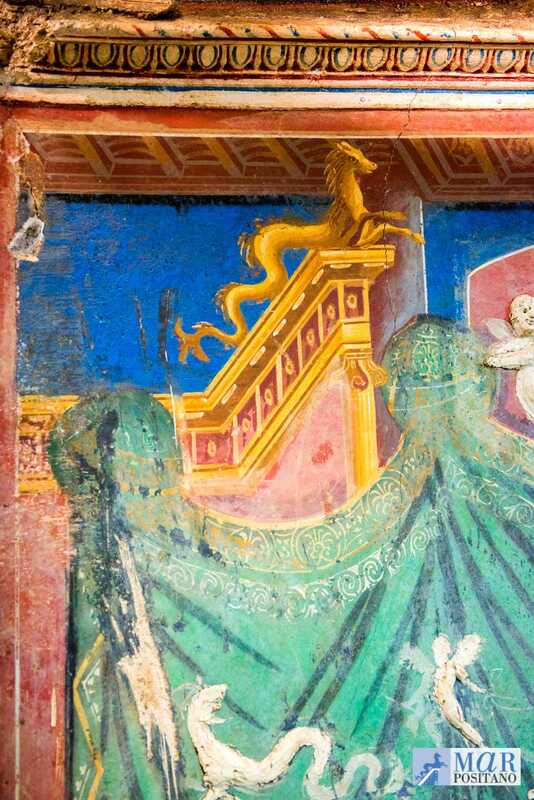 An example of this can in fact be seen in the upper area of the Positano fresco. 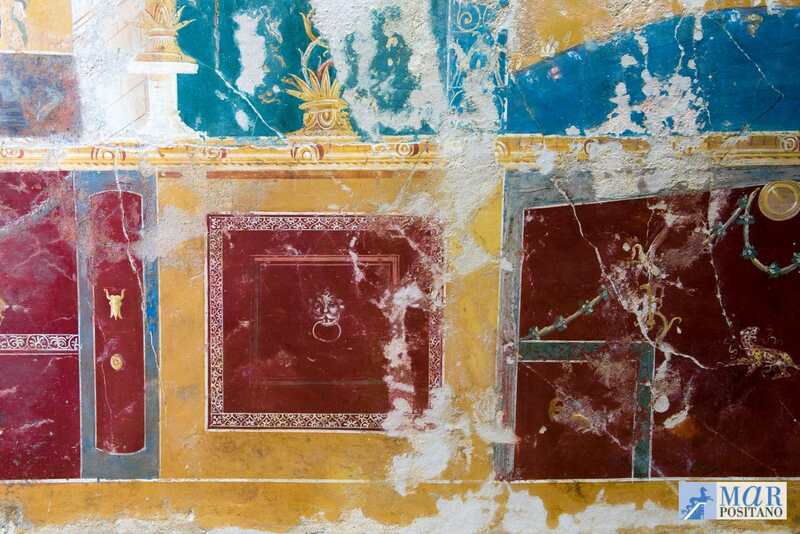 The technique used to paint walls is called “fresco” – because it involved painting on recently laid plaster that was still damp – or fresh (fresco in Italian). It meant that the pigments used merged with the prepared layers of lime and marble dust to form a compact layer in which colours took on a polished look that endured over time. 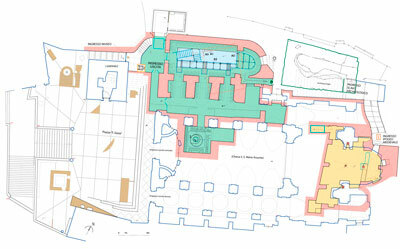 The work was carried out over the course of a day. 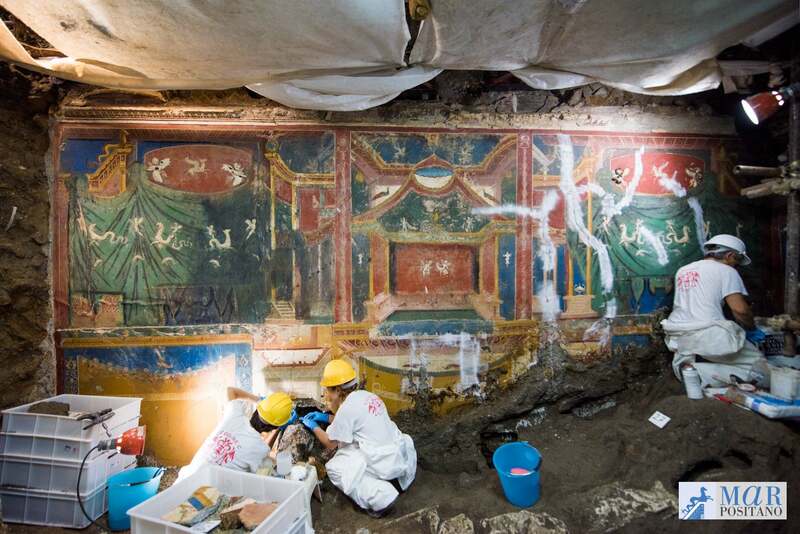 The “decorators” started out on the upper part of the wall, only plastering an area as big as they were able to finish painting in a day, The paintings in the centre of a wall or panel and the vignettes on the side panels were done last. 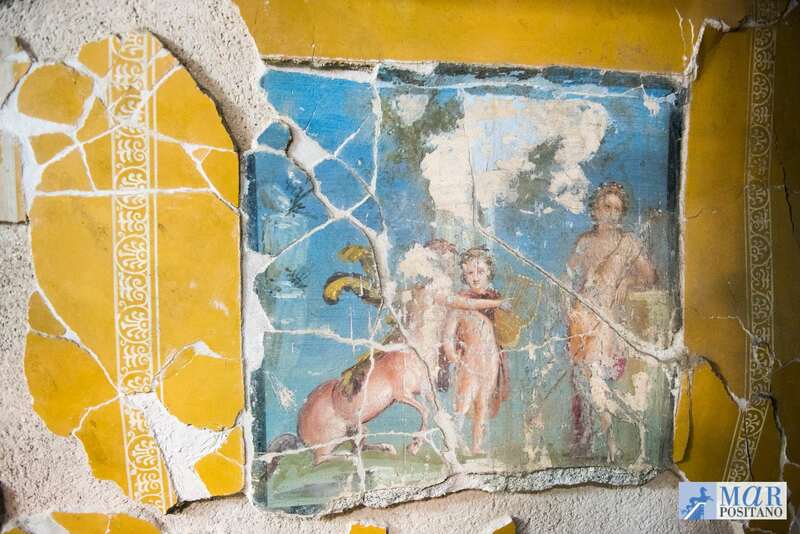 Space was left for the best painters (pictores imaginarii) to draw – thanks to the use of cartoons or pricked tracings – the mythological subjects requested by the home owner. The borders of a repeating motif were created using molds. Most colours used in ancient times came from mineral-based pigments. Yellows, reds, browns and some greens were obtained by decanting natural terrain, or sometimes by using a process known as calcination which brings about thermal decomposition. Other pigments – pink for example – originate from plants – and black is often charcoal based. Blue -often described as Egyptian Blue – was a particularly expensive pigment to create and involved heating a mixture of quartz sand, calcium salts and copper filings (malachite).